Established in 1911, Douglas Elliman Real Estate is the largest brokerage in the New York Metropolitan area and the fourth largest residential real estate company nationwide. With more than 7,000 agents, the company operates approximately 110 offices in Manhattan, Brooklyn, Queens, New Jersey, Long Island, the Hamptons & North Fork, Westchester, Greenwich, South Florida, Colorado and California. 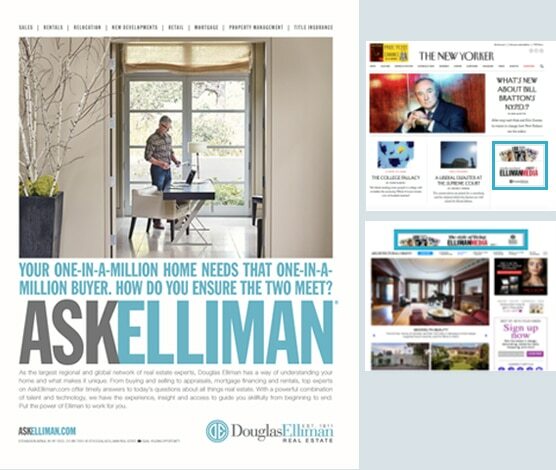 Douglas Elliman runs branding campaigns as well as ads for specific listings and individual brokers to promote their services to high-net-worth individuals in affluent markets, using both print and digital media. For this specific branding effort, a geo-targeted print campaign in three markets drove awareness of the individual brokers’ services at Douglas Elliman Real Estate. The campaign ran in five luxury Condé Nast magazines along with standard banners and targeted an affluent adult audience.